Ken Hom OBE is the man who showed the British how to cook Asian food. A leading authority on Chinese cuisine, he is one of the most respected and celebrated TV chefs of all time. His phenomenal success is easily measured. He is the author of almost forty books, which have inspired millions of home cooks around the world. 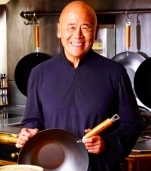 In Britain alone, the Ken Hom Wok is in one in seven kitchens. Ken Hom, who resides in France and in Thailand but travels tirelessly all over the world, continues to appear regularly as a celebrity chef, write new books and keep an involvement with restaurants worldwide. 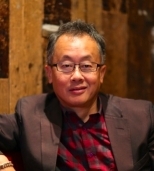 He has presented seven UK television series launching his career over 30 years ago with Ken Hom’s Chinese Cookery. His most recent book is his autobiography ‘My Stir Fried Life’, a high-spirited, life-enriching feast where the chopsticks never stop clattering, the platters are always abundant, and dreams – no matter how ridiculously unbelievable – can and do come true. He is a Founding Patron of the Oxford Cultural Collective, an independent cultural Institute that promotes better understanding of food and drink. The Collective has links to Oxford Brookes University through its foundation, formed to provide students with outstanding learning experience. A great charity supporter, his two main charities are Action Against Hunger and Prostate Cancer UK. Ching is an International Emmy nominated TV chef & cookery author who has become an ambassador of Chinese cooking around the world. Born in Taiwan, raised in South Africa and the UK, cookery was a vital connection between Ching and her Chinese heritage. Ching’s approach to cookery stems from the traditional cooking and lifestyles of her farming community grandparents in Southern Taiwan, and these are her major food influences. Her creative food ethos is to use fresh, organic and ethically sourced ingredients to create modern dishes with Chinese heritage, fusing tradition and innovation. Ching strives to bridge cultural understanding through food, making Chinese cooking accessible, healthy and nutritious, appealing to both the East and West. Ching’s dynamic approach to modern Chinese food is evident in her immensely popular TV work; her influence has spanned a decade in the TV cookery world. Many of her shows are sold, distributed and broadcast around the world. Ching is a regular guest chef on shows such as Saturday Kitchen (BBC1) and This Morning (ITV). She has fronted over 11 series on Chinese Cookery and her credits include; Chinese Food Made Easy (BBC2), Exploring China (BBC2), Easy Chinese: New York & LA; Restaurant Redemption (Cooking Channel USA) and Ching’s Amazing Asia (Food Network). Ching is a regular judge on Iron Chef America (Food Network USA) and The Today Show (NBC). Ching is passionate about new product innovations and techniques, from producing her dynamic nano-silica “Lotus Wok” to collaborating with Yutaka on a range of high protein, gluten-free, noodles made from Soybeans (launched in all Tesco stores in 2017). Ching has consulted on family owned restaurants to international corporations in hospitality, working with brands to execute successful media campaigns. Ching is an award winning cookery author, has published eight best-selling cookbooks, the most recent being Stir Crazy, hitting the number 1 spot on Amazon in Chinese Food and Drink and chosen as the UK’s Best Chinese cookbook by the world Gourmand awards. Ching’s new book will be published in September 2019 by Octopus Books. Ching supports numerous charities from Buddhist Charity TZU CHI, Macmillan Cancer, Centrepoint and Action Against Hunger. 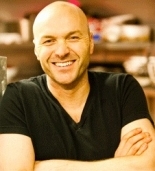 Simon Rimmer is the chef and co-presenter of Sunday Brunch, the Sunday morning show waking up the nation with a mix of chat, current affairs, guests and food. Simon has a wealth of TV experience, and has appeared across many channels including BBC, ITV, C4, C5 and UKTV. Following the success of Sunday Brunch, Simon co – hosted an initial four part Channel 4 documentary ‘Tricks of the Restaurant Trade’, giving insight into the tactics employed by many high end and high street restaurants to entice customers, which followed up with a popular series 2. Its’ success led to a further 12 episodes being commissioned which has just been announced. Simon’s popularity really took off when he landed a role on the BBC2 Sunday show – Something for the Weekend, on which Simon cooked and interviewed guests alongside his co-host Tim Lovejoy. He has presented and cooked on a variety of shows and his numerous credits include: Win It, Cook It, Meals in Moments, Breaking into Tesco’s, Recipe for Success and This Little Farmer went to Market and Eat The Week. To add to his talents, Simon has written and published 5 successful books which continue to sell well. He also regularly contributes to food magazines including Delicious, Olive, and BBC Good Food Magazine and Vegetarian Living. Aside from his hectic filming schedule Simon is a chef/owner of 9 restaurants in the NW England and one in Dubai. Simon’s real passion for food began as a restaurateur and he continues to cook in the restaurants every week, which he enjoys immensely; but also keeps him in touch with the culinary trends of the moment. School of Wok founder, author and TV chef Jeremy Pang comes from a long line of chefs and culinary enthusiasts. Despite the first few years of life where eating was a task rather than a pleasure, Jeremy soon developed his zest and curiosity for food, following his family’s move from the UK to Singapore at age ten. After whetting his palate amidst the bustling hawker centres, Jeremy soon realised the correlation between basic cooking skills and eating well. He attributes his love of food to his father, who approached food with excitement and was eager to share his joy and curiosity with his children. Over the years Jeremy’s expertise in the food industry has continued to gain recognition and awards, including the British Cookery School awards and the Housewares Innovation Awards for his new wok range; School of Wok by Dexam. His recipes and work have been featured in a wide variety of national and international publications, along with TV appearances; from Food Network’s Big Eat, to regular appearances on Channel 4’s Sunday Brunch, ITV’s This Morning, features in several of Nigel Slater’s cooking series, and most recently Saturday Kitchen alongside the Hairy Bikers. Jeremy has consulted with a wide range of brands and businesses; from one person start-ups to international corporations, all whilst keeping good food at the forefront of each undertaking. Jeremy’s first cookbook Chinese Unchopped, helps readers demystify Chinese cooking by providing useful tips and ingredient ‘swapsies’ and unpacks some of the fundamental techniques in Chinese home cooking. His second; Hong Kong Diner, is a love letter to Hong Kong itself; both its food vibrant street food and diner culture and includes both recipes and travel tips for those with a sense of adventure. Jeremy’s ability to bringing food to life with his infectious and relaxed approach has helped to fuel a dynamic specialist cookery school, develop delicious authentic recipes, and create innovative teaching techniques and equipment that are taking the culinary world by storm. Fuchsia Dunlop is an award-winning writer and cook specialising in Chinese cuisine. She trained as a chef at the Sichuan Institute of Higher Cuisine in Chengdu and has spent two decades researching and writing about Chinese food. She is the author of five books, including Sichuan Cookery, Every Grain of Rice: Simple Chinese Home Cooking and, most recently, Land of Fish and Rice: Recipes from the Culinary Heart of China. Fuchsia’s writing has appeared in publications including the Financial Times, the New Yorker, Lucky Peach, Gourmet and Savour. She leads gastronomic tours of China with the travel agency WildChina and has cooked and lectured at events all over the world. Gizzi Erskine has been an integral part of the London food scene for 15 years. After leaving a career as a body piercer in Camden & completing her training as a chef at the prestigious Leith’s School of Food & Wine, she quickly established herself as an award-winning chef, food writer & stylist. Her hugely popular sell-out events & pop-up restaurants have established her as a leader in the London scene. She has collaborated with some of the UK’s most talented chefs including Mark Hix, Angela Hartnett & Tom Kerridge. She's authored many bestselling books including the Gourmand Award-winning 'Skinny Weeks And Weekend Feasts', 'Kitchen Magic', 'Cook Yourself Thin', ‘Healthy Appetite’ and 'Season's Eatings. Gizzi’s successful career in TV began with the Channel 4 ratings winner 'Cook Yourself Thin', ‘Iron Chef’, ‘Cookery School’, and ‘Drop Down Menu’. Gizzi later joined Sky Living as the new face of the channel and hosted the series ‘Cooks To Market’. More recently Gizzi was part of Sky1 show 'Ones To Watch’ alongside Rankin, Idris Elba & Paloma Faith helping to launch the next generation of talent. Her most recent show Seoul Food has been a hit on cable channel Good Food. The show was a refreshing insight into the amazing food & culture found in South Korea, which is influencing foodies all over the world. As a food writer, Gizzi has worked with some of the nation's most favoured publications including The Sunday Times, Marie Claire, Elle, Elle USA, Vogue USA, GQ, The Times, The Evening Standard & she is currently a contributing editor for The Daily Telegraph & InStyle. Gizzi’s new book Slow: Food Worth Taking Your Time Over, a celebration of cooking that puts quality over convenience & speed. With over 80 recipes you can give yourself permission to take time over; recipes for a Friday night or a leisurely weekend, the joys of technique and process are appreciated & love & care is poured into the food. Gizzi's now working on her restaurant "Filth" with nutritionist Rosemary Ferguson & banker Dougal Brech. After a successful pop-up at the Tate Modern in November 2017, they are opening a permanent restaurant very soon. Karen’s career in journalism spans 30 years, working in book publishing, then women’s magazines and heading up the Good Housekeeping Institute before taking the helm at delicious. in April 2010. The delicious. brand – both online and in print – has an empowering, life-changing message at its heart: that anyone and everyone can learn to cook, hone their skills and enjoy the creative process of making fantastic food. In her spare time, Karen teaches food writing, is a keen musician, is a trustee for a charity working with poverty-stricken communities in Africa and is on the board of a new enterprise setting up a food-related initiative working with prisoners. Sonny Leong is currently Chief Executive of the Civil Service College and Executive Chairman of the Academy for Parliamentary & Policy Studies, and Trustee Director of Future First, a social enterprise company, whose vision is that every state secondary school and college should be supported by a thriving, engaged alumni community that helps each one to do more for its students. He is also Trustee of Mulan Foundation Network, a charity supporting the achievements of Chinese women in the United Kingdom. He sits on the Advisory Panel of The Changing Work Centre, advising policy makers of the changing nature of work, and the skilling of young people for the jobs of tomorrow. He is Chair of the Council for Education in the Commonwealth, a parliament based NGO, founded fifty eight years ago, at the time of the first Commonwealth Education Ministers' Conference in Oxford. He has over forty years of publishing experience, having worked in various academic and professional publishing houses. He founded Cavendish Publishing and developed it to be the largest independent academic law publisher in the UK before it was acquired by Informa PLC. He was formerly the Chairman and Hon President of the Independent Publishers Guild, former Chair of International Division and Council member of the Publishers Association in the UK. Sonny Leong is director of Left Foot Forward, a political blog for progressives, providing evidence-based analysis on British politics, policy, and current affairs. He was awarded the Commander of the Order of the British Empire (CBE) in the Queen’s Birthday Honours in 2014. Cofounder of the London Islington Chinese Association, Lady Katy Tse Blair MBE started a pensioners’ Luncheon Club and Meals-on-Wheels home delivery service for the housebound in 2002, the combined services were the only ones of its kind available in the country at that time! Katy is responsible for overseeing the high quality of food preparation, safety and hygiene are complied with the Food Hygiene Standards. Due to robust supervision, the service has continuously been accredited the top award by Islington Council Food Hygiene Rating Scheme. Having been involved in devising the daily menu for many years, Katy believes passionately that wholesome Chinese food should feature the three characteristics: "diversified colour, aromatic flavour and distinctive taste". Hong Kong born Eric Yu commenced his professional life by working and qualifying with KPMG Peat Marwick as a Chartered Accountant in London. After working his way to Manager at KPMG he left to join The Pheasantry Group as Financial Controller. He left in 1991 to set up his first venture and what was eventually to become The Breakfast Group. That first venture was Villa Stefano in Holborn, an Italian restaurant that under Yu’s guidance became one of London’s most successful venues during the early days of house music. This was followed by the institution that is Bar Rumba, plus a host of successful venues including Substation Soho, Substation South, Saint Bar, Jerusalem, Pop The Social. For his next project Yu travelled to Paris and brought back Miguel Cancio Martin who had designed The Buddha Bar and Man Ray in Paris to bring to life his vision that he was to call Opium on Dean Street. The venue was adorned with pictures of Yu’s family from the Far East. In 2003 came Salvador and Amanda, and more recently Punk, Maya and Grand Central in Shoreditch. In late 2012 Eric Yu opened two new venues in quick succession. Salvador and Amanda Bloomsbury and Opium in Gerrard St Chinatown. In 2016 he opened the wine and cocktail bar that is known as 68 and Boston near Soho Sq, followed soon after with Burlock on Duke Street and most recently FAM, another bar located in Marylebone. Awards and acknowledgements include Time Out Best Bar, Evening Standard Best Bar, Flavour Magazine Best Multiple Operator, Theme Magazine’s Most Influential Individual Award and Outstanding Achievement Award at The London Club and Bar Awards of 2011. In 2012 and again in 2013 Eric Yu was nominated for the Industry Legend Award at the Square Meal/Imbibe Awards. Leyla Kazim is a London-based freelance content creator and digital influencer specialising in food and travel, and the person behind The Cutlery Chronicles online profile. She spent the best part of 2015 on one big trip eating her way around the world. From this eight month food odyssey and travels since, she has co-created Lonely Planet’s latest book: The Ultimate Eatlist (2018), which ranks the world's top 500 food experiences. Leyla is also the founder of London Cheap Eats, an online presence widely regarded as the ultimate insider guide to finding the best food in London for £8 or less, which has been featured in several newspapers and websites. Sharing her global stories through her online platforms and a number of online and print publications, you can follow Leyla at The Cutlery Chronicles blog, Instagram, Twitter and YouTube.